When I started doodling ideas for Epiphany it didn’t take long before I decided I wanted to do a tryptich in a more abstract style, giving the pieces gold frames to reflect the border around an icon. As I started to transfer ideas into colours and final form I found myself drawn towards metallic and iridescent acrylics. 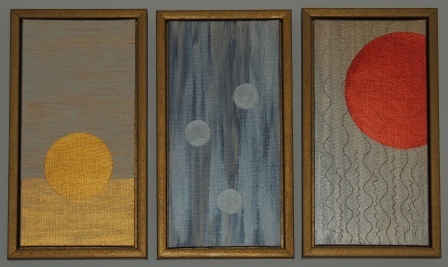 Each 10″ x 5″ panel represents one of the Magi’s gifts, with circles upon a textured background. Despite crib scenes up and down the land what we sing in carols and the traditions that we hold dear, Jesus was no longer in a manger full of hay when the Magi arrived, maybe as long as 3 years later. Nevertheless Epiphany is linked to his birth and the revelation that birth in a stable brought to the whole world. The first panel, signifying birth, uses gold and cream hued paint for the colour of straw with a gold circle rising, like a sun or The Son, from a horizon of the Old Testament rich with promise. The second panel represents worship, with platinum, silvers and bluey greys drifting upwards. Amid the rising worship are three grains of incense, representing the Trinity, for it is all three persons we worship not just the Son. The final panel represents death, for Jesus was born into the world to die and overcome death. A copper disk representing the stone rolled clear on Easter morn coloured by the rays of the rising sun. A child is born and a gift of death is offered. The wavy lines etched into the myrrh coloured paint in the background represent the wandering journey our lives often take in reaching that promise.